Teen Kitchen Project has been running a brunch fundraiser series since March. There were two Sundays in March, then they skipped Easter, and now two Sundays remain — April 8 and 15. Entrees rotate each time and have included Huevos Rancheros with rice and beans; orange-zested thick cut French toast with spiced maple syrup; and broccoli cheddar quiche with country style sausage and home fries. There are two seatings each day, 9:30 & 11:30 a.m., and brunch takes place at TKP’s newly renovated teaching kitchen and café at 8061 Aptos St. Cost is $35 for adults and $15 for kids under 12. The TKP teens do the cooking and serving. Entrees include a basket of freshly baked goods at each table, plus coffee, tea and juice. 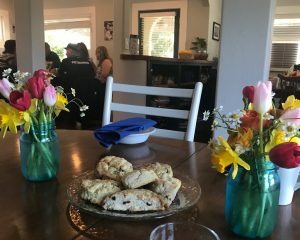 My family and I dined with TKP on March 25, and thoroughly enjoyed the meal–from the delectable scones to scrumptious sausage, Chilaquiles and more! 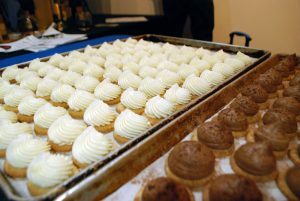 View menus and purchase online at teenkitchenproject.org/brunch.One hundred percent of proceeds benefit TKP. Topics for the older kids have included burgers, tacos and dumplings. During the 2-hour classes, kids work with other students in groups of two to four. There are also adult chefs and a teen helper present. At the end of class, participants get to eat the food they prepare. Monday and Wednesday classes are at the Aptos location (8061 Aptos St.), and Friday classes are at the Soquel location (2880 Research Park Dr.). Enrollment is limited. Visit the registration page at crm.fundly.com//6708/Pages/Events/#/. For those unfamiliar with Teen Kitchen Project, executive director Angela Farley launched TKP in 2012 after her son was diagnosed with cancer. Farley decided she wanted to help other families affected by cancer, to at least attempt to decrease some of the pressure and feelings of being overwhelmed. Today, the organization regularly delivers 600-700 free, healthy meals for clients throughout Santa Cruz County who are in crisis due to illness. Teen volunteers ages 13-18 prepare meals with the assistance of adult volunteers. The teens gain valuable skills as they volunteer. For more info, visit the web site teenkitchenproject.org. Event Santa Cruz is hosting “Bazaar at the Casablanca Inn” this Friday night, Oct. 20, from 5:30-8:30 p.m. The all-ages event is at 101 Main St. in Santa Cruz. Admission is $1 at the door. Guests are encouraged to register at eventsantacruz.com. 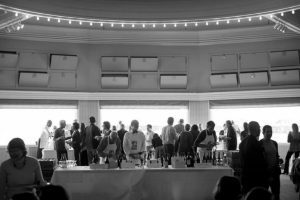 Attendees can enjoy cocktails, craft beer from area breweries, local food, art, crafts, and more. Venus Sprits will be serving Moroccan Nights, a cocktail crafted just for this event. In addition, ESC is teaming up with Yoso Wellness Spa and Santa Cruz Socialites to “Gather for Sonoma.” Attendees are encouraged to bring items or dollars to donate in support of those impacted by the recent wildfires in Sonoma County. Blankets, sheets, personal hygiene items, new and lightly used clothing, new socks and underwear, diapers, baby bottles, and gift cards to stores like Safeway and Target will be appreciated and delivered. One hundred percent of the items and money will be provided to victims, evacuees and first responders. Homeless Garden Project has two Santa Cruz events coming up that sound positively delicious. Homeless Garden Project invites the community to its Pop Up Store for a “taste of the Farm.” Attendees can taste—fresh from the vine—goodies like tomatoes, tomatillos and padron peppers. 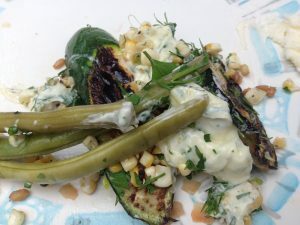 There will also be special treats created by HGP’s Enterprise Manager, Angie Smith, including tomato, Thai basil & mozzarella bites and blistered padrons with avocado crema. 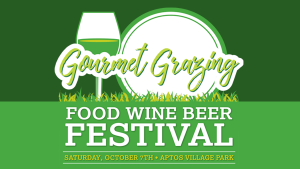 Plus, enjoy live music by Anthony Reyes. In addition to being HGP’s Farm Manager, Reyes is a multi-instrumentalist and vocalist who plays traditional roots/ Americana inspired music while incorporating elements of classical, jazz, and blues. Read more on HGP’s Facebook page. HGP is holding an organic benefit dinner at its farm, the latest in its Sustain Farm Dinner series. Sustain is a seasonal gourmet dinner series featuring organic produce from the farm, wine pairings, and guest speakers discussing sustainable topics. This time the keynote speaker is Tom Steyer, founder & president of NextGen America. The admission fee, $150, benefits HGP. Read more and purchase tickets online. A different chef will prepare each of the dinner’s four courses. Derek Rupp, Owner and Chef at East Side Eatery, will prepare flatbread pizza appetizers. Sara LaCasse, Chef Consultant for Earthbound Farms, is preparing Farm lettuces and herbs with pickled farm vegetables in ginger vinaigrette, while Passionfish owner/chef Ted Walter will create an entrée of chili-lime chicken served with grilled corn, Early Girl tomatoes and Cotija cheese. Aubergine pastry chef Yulanda Santos is providing dessert: zucchini cake with roasted strawberries and lavender-lemon cremeux. 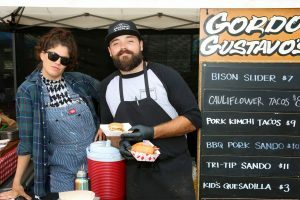 Tickets are on sale for the 2017 season of pop-up breakfasts with guest chefs at the Westside Santa Cruz and Scotts Valley farmers’ markets. The first event (the morning of Saturday, June 3 at the Westside market with chef Erin Lampel of Companion Bakeshop) is sold out, and limited tickets remain for the other three events. Cost is $38 and tickets are available for purchase online and at the markets. See below for more details. I attended a pop-up breakfast with chef Kendra Baker last summer, and it was a very unique, enjoyable experience with delicious food and drinks! In other market news, there is a May promotion that greatly helps low-income Santa Cruz County residents. Traditionally, the Live Oak and Felton markets offer customers with CalFresh (EBT/SNAP) cards a dollar-for-dollar match up to ten dollars. For example, if a CalFresh customer swipes their EBT card for $10 of EBT tokens, they receive an additional $10 in Market Match tokens at no charge. A $7 swipe equals a $7 match. These matching dollars can be used to purchase fresh vegetables and fruits only. During the month of May, in recognition of CalFresh Awareness Month, the Felton and Live Oak markets are offering a DOUBLE MATCH program. Customers receive two Market Match tokens for every EBT token up to $10. So $10 dollars of EBT becomes $30 at the Felton and Live Oak markets. However, funds are going fast and might not last through the end of the month (chances are you can still utilize the promotion May 21 at Live Oak market, and possibly May 23 at Felton market, but not the following week). 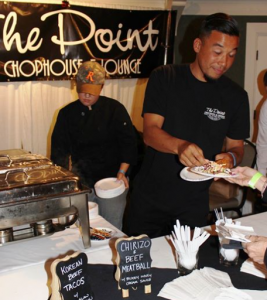 Different local chefs are featured at each event. For each dish at these multi-course meals, nearly 100% of the ingredients are sourced from farms at the markets. Event proceeds benefit the markets’ public educational programs including the Foodshed Project. This year for the first time there will be a raffle at each event to raise additional funds for the educational and outreach programs. The prize is a $50 farmers market gift certificate. Attendees choose their seats by placing their own plates and silverware at spaces along u-shaped, family-style tables beginning at 9:30 a.m. Selections made with ingredients sourced from the markets begin rolling out around 10 a.m. As the guests eat and visit, farmers and chefs share their knowledge and perspectives regarding agriculture, community and consumer choice within the food system. There is also live local music. If you go out for dinner or drinks at the downtown Santa Cruz restaurant Hula’s on Monday nights in April, part of your meal will benefit the Boys and Girls Club. 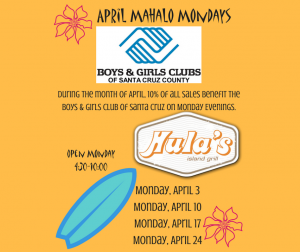 During the month of April, Hula’s Island Grill & Tiki Room – a wonderful place to eat and drink with selections to accommodate many different tastes – is donating 10% of all Monday night sales to the Boys and Girls Club of Santa Cruz County. This promotion is part of the restaurant’s Mahalo Mondays community giving program; on selected months throughout the year, a different non-profit organization receives 10% of Monday evening sales. Between 2008 and 2016, Hula’s donated more than $143,000 to 56 local nonprofit organizations via Mahalo Mondays proceeds. If you haven’t been to Hula’s lately, there’s a great lanai in front providing outdoor seating; it opened in May 2016. The restaurant’s menu features Hawaiian fusion dishes and other choices. Lunch highlights include delicious burgers with beef and veggie options that come with choice of sweet potato fries (warning: addictive), regular fries, slaw or arugula or Caesar salad; rice bowls with black beans, cabbage mix, and choice of “jungle” tofu, wasabi ahi or spicy Thai chicken; and a variety of tacos. At dinnertime, all of these dishes are still available, and there are many more such as Hawaiian fish soup, slow-roasted pork plate, and fresh fish. For seafood, you can choose between six types of fish and select one of six preparation types to match it with. For example, pick lemongrass-encrusted halibut with lime-ginger-cream sauce or pan-fried ono with shiitakes. Hula’s also offers a tiki bar that features 40 different rums, tropical drink specialties and more. The Boys & Girls Clubs of Santa Cruz County promotes youth guidance through educational, vocational, recreational, social and character development of girls and boys ages 6 to 18. The Club is the only youth service organization in the greater Santa Cruz area providing daily afterschool drop-in programs five days a week. There is a downtown Santa Cruz location, and a new Live Oak location that opened one year ago. Boys & Girls Clubs also offer a summer day camp program five days a week from mid-June through mid-August, and Winter and Spring break day camps. 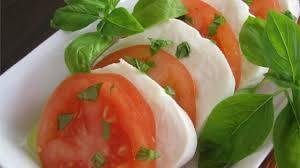 Hours: Dinner nightly 4:00 p.m.–close, lunch Tuesday- Sunday 11:30 a.m.–4:00 p.m., happy hour with daily specials (Tuesday–Sunday 2-6 p.m., Monday 4:30–6).